You’ve got to give it to Sox GM Kenny Williams: he’s great at surprising people with big trades that come out of nowhere. Imagine my shock a few days ago when the pending Peavy-to-South Chicago trade was reported on various news outlets. I listed twelve teams in my post last week regarding where he might go, and the White Sox never factored into my train of thought. Why? The Sox are a few games under .500, and while there’s certainly hope in that tight AL Central race, it’s doubtful that Peavy is going to be the necessary, singular force that pushes them ahead of the Twins, Tigers or even the Royals. The White Sox don’t look like contenders right now. In fact, as of today, the Padres have a better record. It’s the American League, and not say, the sunny Southern California Angels, a well-run and respected organization like the Red Sox or prestige of the Yankees. Ozzie Guillen is crazy, and I don’t think you would want to have him as a boss either. Most importantly, and this is the part that Kenny Williams probably doesn’t get: the White Sox aren’t built to win now, but he thinks they are. To me, this has to be the most endearing aspect of Mr. Williams’ tenure as General Manager: there’s never really a “rebuilding” year. And hey, you can’t fault a guy for trying to deliver a winner every single season (especially when he’s won a World Series in the process). But seriously Kenny, it’s time to throw in the towel, at least once in your tenure. You’re brilliant guy who thinks out of the box and often grabs success where no one else sees potential, but this time you should really switch gears. Those young pitching prospects you were going to ship over here to Petco? Keep them. Keep Gordon Beckham and Carlos Quintin too. You can win a lot of games with those guys in 2010 and beyond. 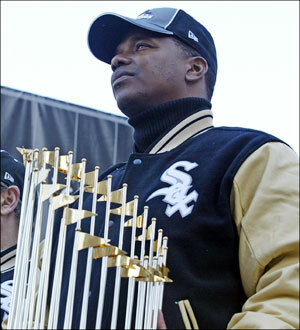 And while you’re at it, see what you can get for Jermaine Dye, Paul Konerko, Jim Thome and A. J. Pierzynski, maybe even Mark Buehrle. They’re all far past their prime (except for perhaps Buehrle), and while still fairly productive, are not going to have a year better than anything they’ve already done. You already won a World Series with most of these guys, and outlook for this year is very poor. So let them go help a contender with their last good-to-above average veteran years, and get back some prospects in return. You’ll may be able to compete next year, if not 2011. To be fair, the Peavy trade would have had the benefit of keeping him on the roster for a few years while the team shifts, and perhaps acquires some free agents to really gear up for next season. So there’s some justification in trying to make this move, but not enough where it makes sense to me. Yes, aces like Peavy are very hard to come by and having one for the next few years would be great, but it shouldn’t be at the expense of some of your top prospects when you’re struggling to reach .500. I’m always intrigued by the strategies involved with managing teams (what baseball fan isn’t? ), but this one just baffles me. Kenny, unlike in 2007, pay attention to the computer this time around. The predictions may not always be accurate, but it spits out those numbers for a reason: your team just isn’t very good this year. Fix it, and make it better for next year.